Want to know the top five author marketing mistakes? 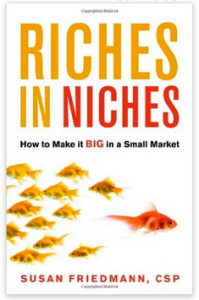 Listen as Susan Friedmann, CSP, niche marketing expert, and best selling author of “Riches in Niches: How to Make it BIG in a small Market,” and “Book Marketing Mentors” podcast host shares her 5 Top Author Marketing Mistakes and How to Avoid Them. If you want to take a quantum leap of success with your author marketing, then listen and take serious action using Susan’s proven tools, tips and techniques. Susan (aka) The NichePreneur™ Coach, is an internationally recognized niche-marketing expert and “how to” coach who helps entrepreneurs, small-business owners and service professionals maximize opportunities to improve results and focus on building better relationships with customers, prospects and advocates in the marketplace. She’s the founder of Aviva Publishing, a vanity press specializing in helping authors get their book to market. Q: We’re here to talk about author marketing. Now, I find this to be kind of an odd term, because if I want to sell a book, I’m going to sell the book! What’s this thing about author marketing? A: I’m pleased you asked that question, because most authors, whether they’re fiction or non-fiction, think about marketing their book. Yes, that’s great, but in the actual fact, if you really want to sell books and become a recognized expert in your field, you need to market yourself and not stand behind the book, which is what many authors like, and feel comfortable doing. They think the book is going to sell, and you’re sort of anonymous behind the book. That’s not what needs to happen. Q: When authors come to you for coaching, what’s the number one mistake that you could guarantee they’re going to make? A: The number one mistake that I find is that they are not investing in marketing. They pour all their money into writing and publishing their book, and somehow, they haven’t even thought about marketing. It’s only once the book is written they ask, “Okay, now what?” They somehow think that they’re going to put the book on Amazon, and it’s miraculously going to sell itself. As you know, that doesn’t happen because Amazon isn’t there to promote your books, and to sell them unless you direct people there. Amazon is merely a shop window, and it’s your responsibility to bring people to the shop window for them to consider purchasing your book. Amazon is not going to do that for you. Here’s the link if you want more information on author marketing or to contact Susan Friedmann. Click here to schedule your complimentary 15-minute author marketing session with Susan.